June 15, 2016 Emily V.
Alright so have we talked about this clutch before? It's not the first time it's made an appearance. I've talked before about how accessories can really enhance a look. And it's so true especially coming from someone who lives in t-shirt & jeans. While my clothing choices might be rather plain, the outfit really comes to together with the accessories. Swap out my heels with flats & switch out the animal print clutch with a solid black bag & you have more of day time look. 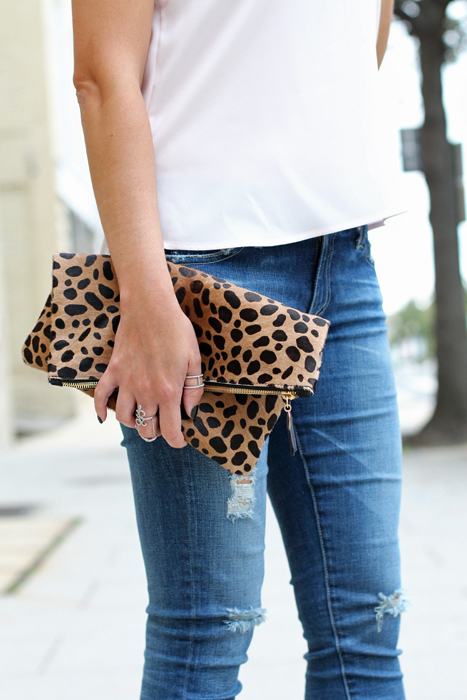 Punching up the accessories turns a top & jeans into an outfit & you're ready for a night out. What's your favorite way to amp your outfits? Do you stick with accessories that pop or keep it low key? Happy Wednesday & thanks so much for stopping by.